The cellphone video, recorded by a classmate, shows Hastings swiping papers off the student's desk then slapping him five times. Hastings, who appears exasperated, scolds the student for being a disruption. 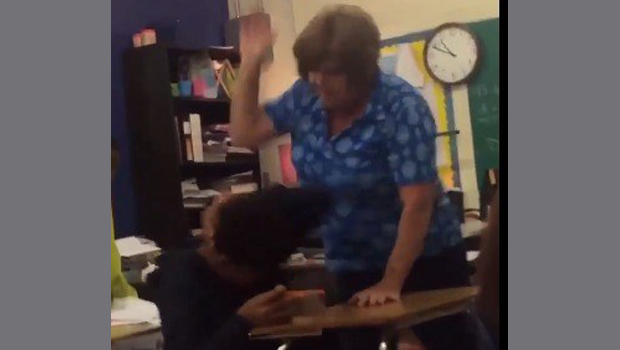 She hit the student while saying, "...because you're stopping him from graduating you idiot [expletive]." The student who recorded the footage told KFDM the incident happened Friday morning. It was unclear exactly what provoked Hastings to strike the student. "BISD does not condone employees abusing any child and will not tolerate such conduct," Beaumont Independent School District spokeswoman Nakisha Burns said in a statement. "The teacher was immediately removed from the classroom and placed on administrative leave pending action on her contract." Hastings was booked into the Jefferson County jail on a misdemeanor count of assault. She posted $2,500 bond and was later released on a $2,500 bond. She has taught in the district for three years, according to KFDM.